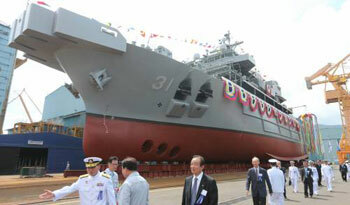 Yesterday, South Korea launched the Tongyeong, its first domestic manufactured rescue and salvage ship. The Tongyeong was laid down in October of 2010 and will join the ROK Navy next year after final fitting out and trials are completed. The ship is intended to broaden the ROK Navy’s salvage and rescue capabilities which are currently served by two former US Navy Vessels. Both vessels are nearing the end of their service lives and the ROK Navy will now be able to respond in half the time to disasters in far-reaching islands. The Tongyeong displaces 3,500 tons and is capable of 21 knots. Armed with an ROV, side-scan sonar, a dynamic position system and various winches, the Tongyeong can search on and below the seas for wrecked vessels and is capable of towing vessels displacing up to 15,000 tons. The ship has onboard medical facilities for treating survivors at sea and can medevac patients via its helipad. With South Korean shipyards now some of the largest in the world, it is only fitting that the ROK Navy can benefit from domestically produced ships and not rely on second-hand ships for rescuing stranded mariners.